Thank you for visiting the website of Kruk & Campbell, P.C. 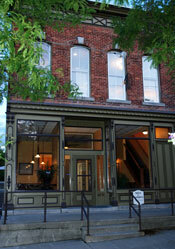 Our offices are located at 7312 East Main Street in the historic village of Lima. We are centrally located and easily accessible from Rochester and the surrounding areas. We have plenty of free parking in our adjacent parking lot and our office is handicapped accessible. Kruk & Campbell, P.C. serves Western New York communities with the finest in legal services. With over 50 years of combined experience, Stephen M. Kruk, Esq., and James W. Campbell, Jr., Esq. are your trusted choice for your legal needs. Mr. Kruk works with clients in matters involving real estate, wills, trusts and estate planning and probate / administration of estates, as well as municipal matters. Mr. Kruk received his law degree from the University of Notre Dame. JAMES W. CAMPBELL, JR., ESQ. Mr. Campbell’s practice is concentrated in the areas of Family Law, Business Planning, Municipal Law and Mediation. Mr. Campbell received his law degree from Case Western Reserve University.